"A Picture is worth 1,000 words" is a classic and well known quote that is used daily around the world. I've heard some people use it to describe a covered call investment, but when I hear this time honored excerpt being used to describe investing I get very nervous. If you see a covered call opportunity with a relatively high return, that picture or spread sheet may say a thousand words with a simple number but covered call investing strategies can not be approached with only a thousand word description. When I am thinking about entering a covered call, a different time honored quotation comes to my mind: "Numbers never tell the whole story." Sure, we all want a high return on our investments but we do not necessarily want to enter into a position that has either too high of a risk or has little potential of becoming profitable. When you look at the % return calculation for a covered call your mouth might water or your eyes might suddenly change into green dollar signs as though you were an old cartoon character, but every investment opportunity has more details and information that must be analyzed in order to get the whole story. The calculated % return possibilities are only the first chapter of the story...maybe only the prologue. When entering a covered call you need to examine not only the returns on the option but the history on the option and on the underlying stock. Whether your strategy is to write options Out of the Money (OTM), In the Money (ITM), or At The Money (ATM), you need to make sure that you check the stock chart to determine if the stock is moving in the desired direction. You need to analyze the stocks' past performance such as the 52 week Highs and Lows, P/E ratio, and volatility just to name a few. The call option itself has several criteria that need to be researched as well before the transaction is completed. Of course the returns on the investments should not be taken lightly. As with any good story it is the first chapter or the prologue that sets the basis for the story. Usually after reading the first chapter in a book you can tell if it is going to be a good story or if it is something that will just take up some time. Naturally we want good investments, we don't want investments that just take up time. So, how does one go about researching these covered calls? How do we start this search? Begin by researching...the "First Chapter" so to speak...is the possible returns on each investment. There are two different methods to go about doing this depending on how you are approaching the transaction. First, if you are ready to do a covered call on shares of a stock you already own you can use the One Strike Tools or the Option Chain on the PowerOptions web site. 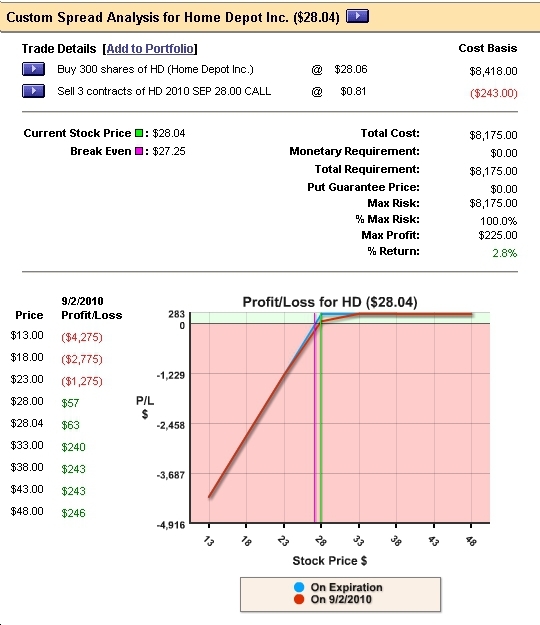 The One Strike Tools will allow you to view the near-the-money options for a certain stock. For covered calls the One Strike Tool allows you to enter in up to fifteen stocks at a time on each template. There are five templates to choose from so you have the opportunity to view up to seventy-five stocks. Simply enter the stock symbols that you are considering and click the submit button. You will be able to view the near-the-money covered calls for the stocks you entered. Once the results appear, you can start by viewing the percent return if the option is assigned (% Assnd column) and the Downside Protection/ % Return if the option is not assigned (Dnsd Prot. column). These are the calculated returns for each position. The displayed information also contains several other columns pertinent in researching the option before getting into the position. There is the Option Bid Price, The Black-Scholes Ratio which tells you if the option is overvalued or undervalued, the Volume and Open Interest of the option which shows you the trading activity of the option, the Delta which gives you the value of the movement of the price in the option in relation to the movement of the stock, the % To Double which tells you what percent the stock price must change in order for the option bid price to double, and the % Probability Assigned which tells you the calculated percent that the stock price will be at or above the strike price at expiration. If you have a good number of stocks that you are considering writing covered calls against, the OneStrike®/Search By Symbol Tool will not only enable you to research them, but it will allow you to compare the data on each possible covered call on the same spread sheet. If you are interested in doing Covered Calls deeper in-the-money or out-of-the-money then you can use the Option Chain Tool. The Option Chain Tool will let you view all of the possible options for a selected stock. This allows you to see the difference in premiums for the different options, their difference in calculated returns, and the difference in their probabilities of being assigned at expiration. By utilizing this tool you can compare and contrast the benefits and risks of each option for the underlying stock you are interested in. The second method you can use to search for returns is by using the SmartSearchXL tool. This tool allows you to search through the entire database of options using either the pre-set criteria on the site or by setting up your own search criteria. You can restrict the SmartSearchXL tool to only look for options with a certain % assigned, Option Volume, the Option Bid Price, Delta, Black-Scholes ratio, Volatility, % to Double and more. 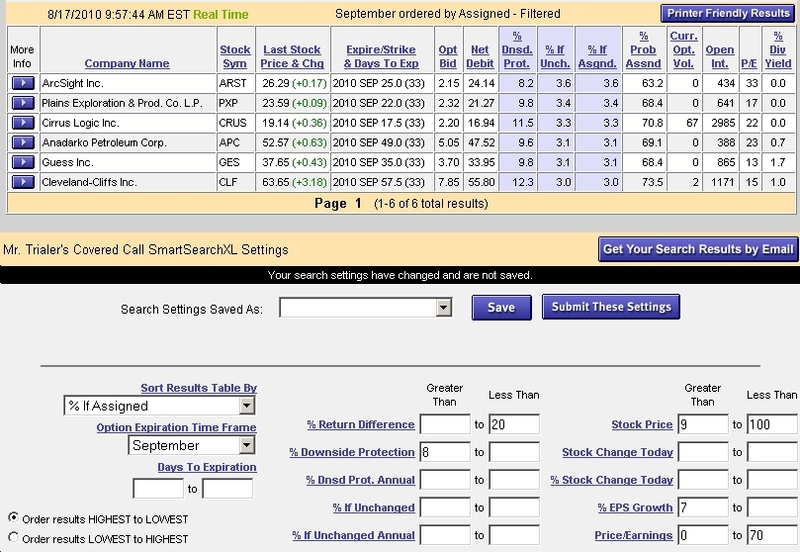 The SmartSearchXL tool also lets you screen certain parameters for the underlying stock. You can screen the underlying stock by limiting the % EPS Growth, the Price/Earnings Ratio, the % of 52 Week Range, the Average Broker Recommendation, Stock Volume, Historical Volatility and more. By setting these parameters you can match up covered call opportunities that match up almost perfectly with your investing ideas and strategies. The SmartSearchXL Tool is particularly useful if you are considering picking up some new stocks and seeing how covered calls will work out with them or if you are specifically looking to turn high returns on a month by month basis using covered calls. We are now roughly 1,000 words into this TipSheet. Hopefully by now this TipSheet has given you some new information that you did not know about before. But, has it convinced you to change your methods of researching for covered calls or how to approach covered calls? With only 1,000 words it is difficult to convince anyone to do anything. So, the picture might be worth 1,000 words, but it definitely does not tell the whole story. Read on for further tips on entering a covered calls. It is imperative that you research both the properties of the stock and those of the option you might be planning on writing. Another important tool that can be used is the More Info Buttons that appear in each page mentioned above (the blue arrows next to the stock symbols in the spread sheets). The More Info Buttons give you direct links to the Company Information, News, Profiles, Stock Charts, Research, the Option Chain, and Profit/Loss graphs for the different strategies. The links from the More Info Buttons can help you gauge the security and size of the underlying company, if the stock is moving in the desired direction for the investment that you are planning, if there have been any sudden drops in the stock or any splits recently, and of course what news articles have been released regarding the company over the past several weeks. This will help you in determining which company is the most stable and is less likely to fluctuate on you. By researching this aspect of the company you can somewhat limit the possibility of any surprises that might come along before the expiration date of your options. The More Info buttons also allow you to enter any position you see on PowerOptions into your own PowerOptions Portfolio. So once you decide on a certain trade or wish to paper trade the position, with one click of the mouse you can add a discovered trade into your customized PowerOptions Portfolio. Another tool that can be used to research both the underlying stock and options is the Research Tool. This tool gives you all of the historical information and pricing information for the stock or for the option. Simply click the Research Tool and enter the stock or the option symbol into the space provided. The information provided for the underlying stock includes the Volumes, the P/E, Sales, the Debt/Equity ratio, Volatilities, Earnings per Share, Recommendations, and Consensus Estimates as well as other information. This information will help you to determine the stability and long-term dependability of the underlying stock. The option researcher will give you detailed information on the Bid Price (including the Last, high, low, and the time of the last recorded trade), interest, the Greeks, % return (both simple and annualized), time values, volatility and Black-Scholes ratios. This information should help you to pick the best option strike price for the particular underlying stock and also help you to determine if the trade is worthwhile. Write an opening sentence or two on why you got into this position. What was it about this transaction that made it more appealing than some of the others you were considering? Was it because the underlying stock was strong or because you thought the covered call return was too good to pass up? Have you been watching this stock for some time and this is the best price or the best circumstances you have seen so far to enter this position? Is the stock moving in a certain direction at the time you entered the position, or do you have a feeling that it is headed in a certain direction and you want to take advantage of that movement? These reminders will help you to remember why you were so certain of this transaction as the day to expiration gets closer and closer. If you notice that all of these things that were originally appealing to you about the transaction are now going against you, you might want to get out of the position before expiration. Set up your goals and points for the transactions. If you do get into this position at what stock price do you want to get into it at? What range of stock price will supply the highest possible return without becoming too risky? At what strike price are you going to write the option at? Compare the ATM, OTM, and ITM options for each transaction contrasting the risks to the rewards of each. Where are you going to set your stopping point or ejection point for each transaction you are considering and why? What is the maximum range in either the fall or the rise of the underlying stock price that you will still be comfortable with? It is impossible to pick the movement of the market 100% of the time, but by setting your points and goals on these transactions you have a working model to know when it is time to unwind, when it is time to roll your options up or down, or when it is time to just walk away from the whole thing. Plan on the Exit for the transaction before you get into it!!! This is probably the most important part of the worksheet. If you don't do a full worksheet on your transactions you must at least plan on exiting the transaction and calculating all of the possibilities for this investment. You should never enter a transaction without planning on the exit. The ideal case for most covered calls is that the stock price remains the same and you collect the premium. But you have to be prepared for the other possibilities as well. What happens if the stock suddenly falls on you? Do you keep the current option open and let it expire, or do you roll down the option to the next lowest strike price? What happens if the reverse scenario occurs and the stock suddenly shoots up on you? Are you going to leave the option and get assigned at expiration or are you going to roll up with the stock price? If you do not plan on an exit strategy you may end up wondering how you lost on this transaction when the expiration date comes. By planning on an exit strategy and writing it down in your worksheet you are also able to check your position at any time during the expiration time frame and deciding if it is still sensible to remain in the position. The PowerOptions Portfolio allows you to enter stop loss limits as well as notes for any transaction. These limits and notes will help you develop your position worksheet and keep watch over your trades. The notes and limits will be saved for each of your positions. More information on exit strategies is available in another TipSheet, you can logon to the HELP section of the PowerOptions website to read it early. It cannot be emphasized enough just how important the research and preparation for a covered call transaction is. You need to research the pros and cons of each investment, looking at the data on both the underlying stock and the option. The criteria, filters, links and data on the PowerOptions site will definitely assist you in your investing research. Use the SmartSearchXL, the OneStrike/Search By Symbol and the Option Chain to screen for good covered call returns on strong or stable stocks. Use the Research tool and the more info buttons on the other pages to research the company profile and information. Always, ALWAYS make a worksheet for each transaction specifically focusing on the exit strategy for the position. This will help you in not getting caught by sudden shifts in the underlying stock. Prepare yourself for every possible scenario you can think of BEFORE you enter the trade. Once you enter the trade, follow your transaction using the guidelines on your worksheet to monitor the movement of the stock, keeping in mind your exit points that you established at the beginning of the trade. By using these techniques your investing strategies will become more focused and you might gain more confidence in your decisions. No one can ever predict the movement of the market all of the time, but by using these techniques you can be prepared for any scenario even before you enter the covered call position. Use this tool to do a general search on all of the options in the options market. Screen by percent return, option volume, option bid price, Black-Scholes ratio, delta, and others. Screen the underlying stocks with %EPS growth, P/E ratio, broker recommendation, stock volume, volatility and others. This tool allows you to match up high return covered calls with strong and dependable stocks. Use the OptionChain Tool to search one stock at a time viewing all of the options available for that particular stock. This tool lets you view the options for several months out and as deep ITM or deep OTM as you can get. You can compare risk vs. reward for each strike price. Enter up to seventy-five different stock symbols and view the near-the-money options for each stock. 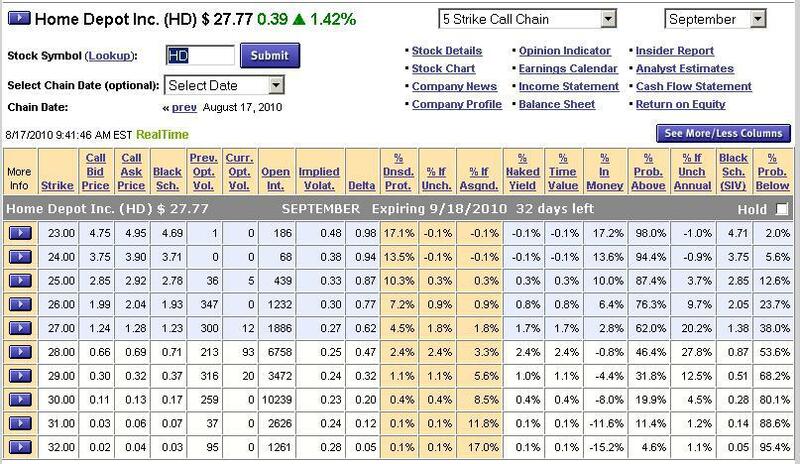 Compare the returns and probabilities on the covered calls for each stock. The OneStrike Tool and the OptionChain Tool are useful if you have been following one specific stock for a while and are interested in investing in that company. Use the research tool to get detailed information on both the stock and on the option you are considering. This will give you historical information as well as current prices, expected volatilities for 20, 50, and 100 days, earnings per share, and broker recommendations. The option researcher will give you the percent returns (both the simple and the annualized), the time value which is important to monitor the decrease in the option towards expiration, and the Black-Scholes values for the option. These details will help you further calculate the stability and profitability of the covered call position you are considering. Use the blue-arrow links by the stock symbols on each page to view the stock chart, the company profile, any recent news articles concerning the company, estimates, indicators, insiders and other important information. From the SmartSearchXL Tool and the OneStrike Tool you can use the more info buttons to link directly to the OptionChain Tool or to link directly to the PowerOptions Research Tool mentioned above and the covered call calculator. You can also view the Profit/Loss charts for any position shown on PowerOptions, plus enter a possible trade into the Portfolio. Once you enter a position into the portfolio, you can enter in your stop limits and individual notes for each and every transaction.